Base, you can use a sponge cake or a brownie. *Be aware that the final product does contain raw egg. Separate egg whites from the yolk and pour the egg whites into a clean metal bowl. Beat on low-medium with an electric mixer or whisk until firm peaks form. This usually takes about 5 minutes. Turn beater up to medium-high while gradually adding the caster sugar for 5-7 minutes. Beat for a further 2 minutes, until the meringue looks glossy. Line a tray with baking paper and place on it a nice thick slice of cake. Scoop some ice -cream on to your cake. 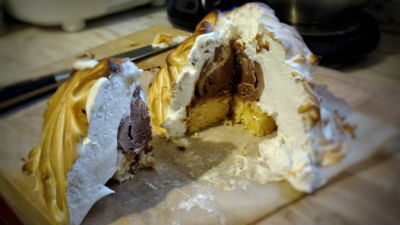 Use a spoon to dollop the meringue all over your cake and ice-cream. Make sure it’s completely covered! Bake at 230-250 °C for 2-3 minutes. The ice-cream didn’t melt! How is this possible? Heat tends to move from hotter thing to cooler things. Air is a great thermal insulator, meaning that it does not let heat pass through it easily. The meringue, that we have covered the ice-cream with, is made up of countless tiny air pockets and bubbles. These air pockets and bubbles block the heat of the oven from reaching the ice-cream, keeping it cold. We use the same principle to help keep our houses nice and warm in the winter. Plastic foam, or fiberglass insulation, is often placed between the walls or in the ceiling to trap layers of air, preventing heat loss. So when the heater is running, or the fire is going, you stay nice and toasty. Is it the meringue that stops the ice-cream from melting? Try putting some ice-cream into the oven without the meringue. Do so in an oven-proof container next to the Baked Alaska and compare. Whipping time- Would the length of time you spend whipping the egg whites effect the insulating ability of the meringue? Try it! Amount of sugar- Try cooking the Baked Alaska with more or less sugar. Does this affect the structure of the foam and therefore how well it insulates heat? Heat source- Oven, grill, blow torch or microwave? Which method works, and which does not? Which produces the best product and why?